Since that time, the College has sustained record-high graduation rates, reduced time to degree completion, achieved record levels of racial and ethnic diversity, and been recognized with numerous honors, including being named to the “Best National Universities” list by U.S. News & World Report; “Best in the Midwest” by the Princeton Review; MONEY Magazine “Best” List for 2017-18; and more. Through the engagement of Trustees, faculty, staff, and students, the College has articulated a bold, forward-looking vision supported by a new strategic framework that guides institutional action. Dr. Flanagan is a respected leader both in higher education circles and locally. He serves on the Executive Committee of the Board of Directors for the National Association of Independent Colleges and Universities (NAICU) and is the chair of the Committee on Accountability. Flanagan is the chair of the Northern Athletics Collegiate Conference (NACC), the NCAA Division III conference in which the Edgewood College Eagles compete. Since 2016, Flanagan has served on the task force for the Association of Catholic Colleges and Universities (ACCU) New Presidents’ Workshop, and he presents annually at that workshop. Locally, Flanagan currently serves on the Business Education Collaborative - Madison Regional Economic Partnership and the Higher Education Advisory Board for Congressman Mark Pocan. A member of the Edgewood College community since 1998, Flanagan’s previous roles have included Dean of Admissions and Financial Aid, Vice President for Planning & Enrollment, interim Chief Financial Officer (twice), and Executive Vice President. In addition, he has taught a doctoral course in Higher Education Finance. Flanagan previously served as Director of Admissions, Director of Athletics, and Assistant Vice President for Enrollment Services at the University of Saint Francis (IN), where freshman classes tripled during his five years of leadership. Flanagan currently serves as a Peer Evaluator for the Higher Learning Commission. During his career, Flanagan has successfully led development and implementation of two strategic plans, implementation of new athletic programs, establishment of an off-campus site, and creation of a comprehensive plan for diversity. Flanagan has been a presenter and consultant on trends in higher education, strategic planning, enrollment management, leadership, and change management. While a member of the Oregon, Wis. Board of Education, Flanagan was a key contributor to Accountability for Student Achievement, a policy paper which received recognition from the National Association of School Boards. Flanagan holds a doctorate in Higher Education Management from the University of Pennsylvania, where his dissertation was recognized with distinction. He earned an M.B.A. from the University of Saint Francis, and is a Phi Beta Kappa graduate from the University of Wisconsin-Madison with an undergraduate degree in political science. 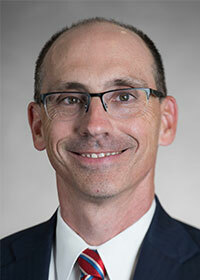 Michael Guns joined Edgewood College as Vice President of Business and Finance in April 2011. Prior to his current position, Mr. Guns served as Chief Financial Officer of Lutheran Social Services of Wisconsin and Upper Michigan and as Vice President of Finance for a national health plan. Mr. Guns is a Certified Public Accountant with public accounting experience serving mission-driven organizations including colleges and universities. He brings a wealth of financial management and facilities management expertise. Dr. Heather Harbach joined Edgewood College as Dean of Students in August 2017. Prior to her current position, Dr. Harbach served as an Associate Dean of Students at the University of Wisconsin-Milwaukee and in various Student Affairs professional roles at Mount Mary University and Marquette University. Her areas of expertise include student conduct, Title IX compliance, university-neighborhood relations, residence life, student leadership and organizations, and new student orientation. In addition, Dr. Harbach currently teaches doctoral courses in Student Affairs Leadership. Dr. Harbach holds a Bachelor of Science degree in Political Science from the University of Arkansas in Fayetteville, Arkansas, a Master of Science degree in Counseling and Student Personnel Services from Oklahoma State University in Stillwater, Oklahoma, and a Doctor of Education in Educational Leadership from Edgewood College. She is a proud first-generation college student and graduate. Maggie Hopkins, O.P., inspired by and aware that at the heart of all we do is relationship, assists the President, leadership and the College community in the ongoing education and promotion of Edgewood College as a liberal arts Catholic college in the Dominican Tradition. Sr. Hopkins has served Edgewood College since April 1991. She became a vowed member of the Dominican Sisters of Sinsinawa in 1966. Prior to joining the President’s Council in July 2018, Mary served as Director of Dominican Life, providing leadership for students’ spiritual development and vocational discernment; community reflection and prayer; understanding and integrating the resources our Dominican Catholic intellectual tradition and mission contribute toward current needs and opportunities. She began serving in that role when she arrived in 2004. Since that time, she has traveled with students and colleagues for numerous professional development opportunities related to the College’s Dominican Catholic mission, including the annual Students’ Preaching in Action conference; the Dominican Summer Study Seminar in Fanjeaux, France; and Biennial Dominican Colleges and Universities Colloquia. Mary holds a Masters degree in Theology from Marquette University. She brings to her work classroom teaching experience and more than 20 years’ of parish ministry at Holy Mother of Consolation Parish in Oregon, Wisconsin. Mr. Klein brings nearly twenty years of experience in fundraising and development in higher education. During that time he has demonstrated the ability to build a culture and system of philanthropy and the ability to build rapport with faculty, staff and donors. Mr. Klein previously served as Vice President for Institutional Advancement at Viterbo University in La Crosse since 2002. During that time, he developed and led the successful completion of a capital campaign that generated more than $40 million for Viterbo, surpassing the original campaign goal. Prior to his work at Viterbo, Mr. Klein served for five years at St. Mary’s University in Winona, Minn., where he progressed from Director of Major Gifts to Vice President for Institutional Advancement. Dean Pribbenow, Ph.D. has served as Vice President for Academic Affairs/Academic Dean since July 2012. Prior to his current role, Dr. Pribbenow served as Dean of the School of Integrative Studies for more than five years. Dr. Pribbenow has a Bachelor of Arts degree in English from Luther College, a Master of Science degree in Counseling from the University of Wisconsin-Whitewater, and a Doctor of Philosophy in Educational Leadership and Policy Analysis from the University of Wisconsin-Madison.